oh Cam, now would you give this home creation a name? looks so good! 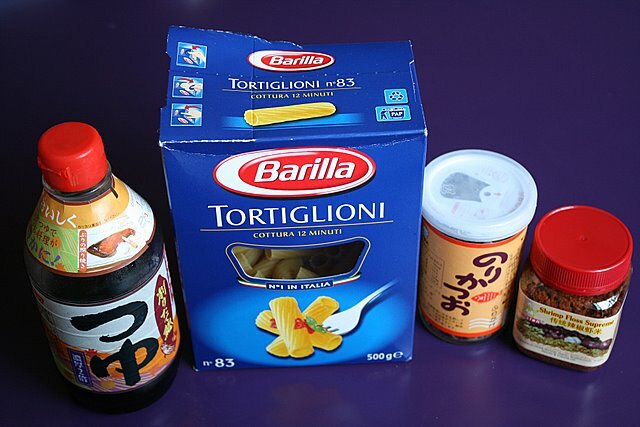 Woah, hae bee hiam pasta sounds so delicious. We are now crazy over furikake on plain rice, never thought of adding them to my pasta. 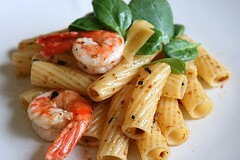 Ice: Prawn tortiglioni with shrimp floss sambal, seaweed and sesame seeds? Hae bee hiam pasta can already la. Wah Wild Rocket now also got! I haven't even been there to try their laksa pesto pasta. XY: hmm, chili crab pasta! Why don't you try it and tell us about it? Breadcrumbs: ah well, probably my own fault overfantasizing about how good it SHOULD taste. XY: yes, it's ok, I knew it was you. LIC: haha, nothing to do with teh DSLR lah. this phenomenon has existed long before cameras were here - it's called "ho kua bo ho chiak!". Didally: I love furikake too! But actually it may have clashed with the flavour of the hae bee hiam! XY: yeah I was just too timid with the seasoning. Kenny: Furikake is Japanese dry seasoning, often consisting of seaweed, dried fish like katsuo (tuna) or salmon, sesame seeds etc. Tsuyu is flavoured soy broth/sauce, often used as dipping sauce for noodles. Ya they all so pandai! It's my first time cooking this kind of pasta some more. Tortiglioni. I can barely spell it! Kenny: Clever readers as a compliment to writing? Thanks! I never thought of it that way! K-man: lol can I put in an order too? need better hae bee hiam!! !